Have you ever wondered what that orange/red plant pushing up through the soil during one of your outdoor trips to Wawang Lake? The main edible find in our region is lobster mushrooms, Hypomyces lactifluorum, in some pretty good quantities too. On any hunt, it’s good to bring home dinner, but one doesn’t typically expect to bring home a bundle of lobsters too late into the fall. 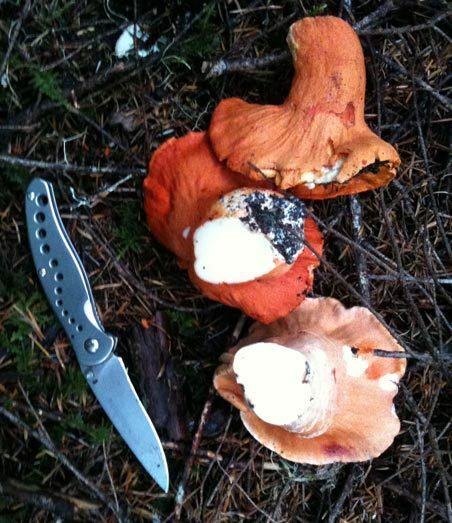 So on your next trip out into our region whether you’re fishing or grouse hunting be sure to hike the old logging roads in search of these very delicious mushrooms. They are best boiled, then stewed in a sauce or soup, cut into small dice chunks, or thin strips and let them absorb the flavor of the sauce.